• Cantech 103 general purpose industrial grade masking tape for packaging, closing, light duty bundling, tabbing and holding. 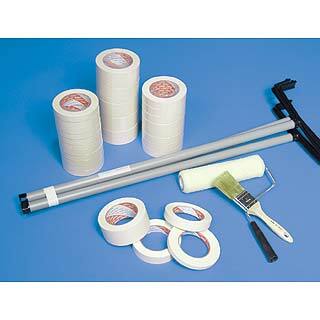 • Sticks to all surfaces and comes off cleanly without leaving a messy residue; ideal for labeling all types of items. • Resists bleed through and is easy to tear; ideal for non-critical indoor paint masking. • Available in a wide variety of widths from 1/2” to 3”. • Tensile strength is 18 lbs. per square inch and 5 mils thick.